brush; otherwise, paint will drip on the deck or other surfaces and run down the handle.) Hold the brush at right angles to the surface being painted, with the ends of the bristles just touching the surface. Lift the brush clear off the surface when starting the return stroke. If the brush is not held correctly and is not lifted, the painted surface will be uneven, showing laps and spots and a daubed appearance. Also, a brush that is held at any angle other than a right angle will soon wear away at the ends. For complete and even coverage, follow the Navy method and first lay on, and then lay off. Laying on, means applying the paint first in long strokes in one direction. Laying off, means crossing your first strokes. The proper method is shown in figure 18-5. By using the recommended Navy method and crossing your strokes, you can distribute the paint evenly and completely with a minimum amount of paint being used. Always paint the overhead first, working from the corner that is farthest from the entrance of the compartment. By painting the overhead first, you can wipe drippings off the bulkhead without smearing the bulkhead paint. When overhead surfaces are being painted, sections should normally be painted in a fore-and-aft direction; beams, in an athwartship direction. But where sections of the overhead contain many pipes running parallel with the beams, it is often difficult to lay off the paint in a fore-and-aft direction. In such situations, better results are obtained by laying off the paint parallel with the beams. To avoid brush marks when finishing up an area you have painted, use strokes directed toward the last section finished, gradually lifting the brush near the end of the stroke while the brush still is in motion. Every time the brush touches the painted surface at the start of a stroke, it leaves a mark. For this reason, never finish a section by brushing toward the unpainted area. Instead, always end up by brushing back toward the area already painted. When painting pipes, stanchions, narrow straps, beams, and angles, lay the paint on diagonally, as shown in figure 18-6. Lay off along the long dimension. Always carry a rag for wiping up dripped or smeared paint. Carefully remove loose bristles sticking to the painted surface. Cutting In After you master the art of using a paintbrush properly, learn to cut in. Cutting in is a simple procedure that you can learn in a short time. Suppose you have to cut in the angle between an overhead and a bulkhead, as shown in figure 18-7. Start at one corner. Hold your brush at an angle of about 76º to 80º from the bulkhead and about 10º from the overhead. Draw your brush along in fairly long, smooth strokes. This is one job where working slowly does not produce better results. The slower you stroke, the wavier your line will be. Use of Rollers The type of paint roller (fig. 18-8) used in the Navy is equipped with a replaceable cylinder of soft fabric over a solvent-resistant paper core. It rotates on the shaft of a corrosion-resistant steel frame. 18-18 Figure 18-4.Correct way to hold a brush. 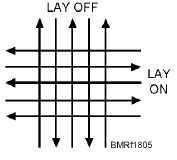 Student Notes: Figure 18-5.Laying on and laying off.